"What if your organization’s culture encouraged you, and everyone who worked there, to embrace self-care without guilt? What if you could feel the vibrancy of your organization when you stepped into the physical office or hear it in the voices of staff when they talked about what it is like to work at your organization?" 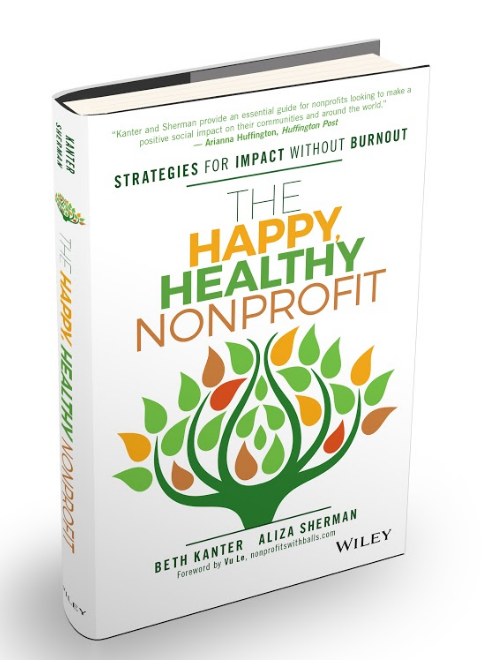 These are questions you're asked in The Happy Healthy Nonprofit: Strategies for Impact without Burnout, Beth Kanter and Aliza Sherman's newest book that was just released. And not only are you asked these questions, but you're walked through the answers in a tangible, realistic way. Their goal is for you to actually accomplish these things. NTEN just released a new report for the nonprofit technology sector, "The State of the Nonprofit Cloud," which found that out of 780 nonprofits surveyed, 91% use some of kind of cloud-based software solution. The most commonly used cloud-based systems were staff email solutions, at 69%, followed by broadcast email 57% and office software 44%. Over 37% of nonprofits were using two to four cloud solutions and 42% were using five or more cloud solutions. Nonprofit communicators, marketers and strategists are frequently urged to be more like their colleagues in the for profit world. In fact, at a recent conference I heard a vice president of digital innovation for one of the world’s largest public relations firms condescendingly tell his nonprofit audience “you’re marketers too, you can do any thing they can do.” I’m sure anyone reading this can come up with 15 flaws in that statement in about five seconds. Blackbaud just released the 2011 donorCentrics Internet and Multichannel Giving Benchmarking Report. This report analyzes data from 28 organizations (some of the biggest national nonprofits in the U.S.) and includes transactions for over 15 million donors and $1 billion in revenue. Nonprofits get excited when a celebrity wants to join their advisory board or endorse their campaign. But do celebrity endorsements across different channels work these days? It depends. I have always been really ambivalent about Disney princesses - Snow White, Cinderella, Aurora, Ariel and Belle. Yuck. They reinforce the worst stereotypes about women (and men). A) That we (women) are passive creatures waiting for the prince to come. B) That men have all of the answers and are the answers to our problems. I’m also turned off by the fact that none of them look like me. I’m an African-American woman. Disney princesses are mostly white. While high dollar donors comprise less than 2% of total online donors, their gifts make up 18%+ of funds raised ever year. Chances are, your organization doesn’t have a 4-digit donor strategy as part of your online fundraising program, but organizations may want to start experimenting with one.